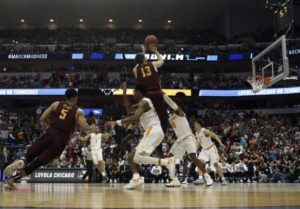 Last year as an 11 seed, the Ramblers made it to the Final Four for the first time since 1963, behind an incredible run that saw them hit two game-winning shots. This was part of an incredible season that included a Missouri Valley Conference Championship, as well as having upset wins over Florida, Miami, and Tennessee. The Ramblers did face one of the easier paths to the Final Four, however, you can only play who is in front of you. Clayton Custer was the leading scorer for the Ramblers, which helped him win Missouri Valley Player of the year, although the Ramblers had six guys who could beat you on any night. Marques Towns was a key scorer, Ben Richardson was a great defender and passer, Cameron Krutwig was a good low-post scorer and rebounder, while both Donte Ingram and Aundre Jackson were big inside playing as an undersized four. This team fit well together and played a style of basketball that was tough to beat, helping them achieve so much success. This year the Ramblers were unable to schedule that well, in part because no one wanted to play them. The Ramblers most notably will host Nevada in the Missouri Valley/ Mountain West Challenge, which promises to be an incredible game. The Ramblers will also play Maryland in Baltimore and at St. Joseph’s in non-conference play. The Ramblers will also play two games in the Fort Myers Tip-Off, where they will play Richmond, and either Boston College or Wyoming. The Ramblers kick off conference play January 2nd against Indiana State and will finish the season on March 2nd, where they will play Bradley. The Missouri Valley formats its Conference scheduling to where they will play each team once at home and on the road. The Ramblers lose a lot with Ben Richardson, Donte Ingram, and Aundre Jackson all graduating, as they filled a lot of roles for Loyola-Chicago. The Ramblers should be led once again by Clayton Custer, who should continue to lead the Ramblers in scoring and assists this season. Marques Towns will join him in the backcourt as another good scorer, likely finishing second on the team in scoring this year. Cameron Krutwig should continue to be a monster at the Missouri Valley level inside, once again being great inside while being an elite rebounder. The key will be who can step in alongside those three this season though. Lucas Williamson will start at the three guard position this season and he will be asked to a lot more this season. The battle for the last spot in the starting lineup will probably come down to either Christian Negron or Bruno Skokna, Negron has much less experience for the Ramblers but does play the four, Skokna could be the fit but that would force the Ramblers into a four-guard look. Both will need to step up this season for the Ramblers to be good, no matter who starts. The Ramblers also need both Franklin Agunanne and Cooper Kaifes to step in right away and be able to provide some depth for the Ramblers this season. The Ramblers probably won’t be able to beat the same caliber of teams this season, however, they still should roll through most teams in the Valley. The Ramblers best game against Nevada will be a probable loss, while games against Maryland and at St. Joseph’s will be tough but they should win every other game in non-conference play, allowing them to enter conference play either 11-2 or 10-3. The Missouri Valley should be better this year but I think they probably go around 15-3 in conference play, which should win them the conference. The Ramblers will then need to probably win their Conference Tournament to get into the tournament despite what looks to be a good record. If they do make the tournament, they probably will lose in the first round and they will not make the same run as last year, as this team just has too many holes this year.